Capturing the greatness of the Doberman genetically, cultivating their minds through education. Well... I was a child when I was kissed for the first time by a pretty little girl named Debby who was my folks first Dobe. Over the years since, I have had the privilege of waking most mornings by a kiss from other lovely 'ladies'. The first photo on this page of my Poco changed my life. Okay while this may seem to be a guy’s brag, it's a fact. The morning of the day I wrote this I once more awoke to a gentle kiss from my London my best girl and a great ball player - actually she's quite the protector too. And of course there's my boy Caspian who moves in at every opportunity to give me a little smooch and remind me he lives for my attention, he's my other serious ball player. When I retire each evening these two Dobermans with a combined weight of 190 pounds will cuddle up on the same bed most nights and clean each others ears before they settle in for the evening even though there are three canine beds. One usually for a student canine learning the rules of night. In the morning my pair must hear my eyes open for before I'm actually awake they are up and each will be sitting there a ball in their mouth hoping they can talk me into an early game of ball. Building a fully controlled bloodline has given me the 'now' understood variables of genetic individuality that today help me in final selection when I match breeding pairs that create these special life companions called Hoytt Dobermans. 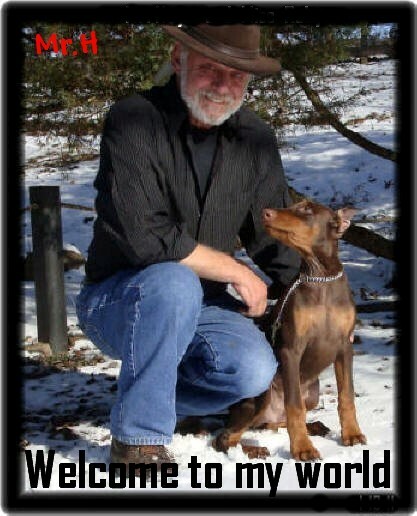 We are an exclusive Breeder of the Doberman since 1945. Since 1982 we have been in eastern Tennessee just 35 miles from Pigeon Forge, Gatlinburg and The Great Smokey Mountain National Park also known as the Blue Ridge Mountains, oh yes and Dollywood too. As a believer in pre-education for my clients, working for our clients our trainers have seen more of their Dobes make the Doberman Pinscher Club of America Top20 monthly and end of the year standing then any other breeder of the Doberman for almost 30 years. Every one of these winners are 100% Hoytt breeding and even as far back as 1972 a client trained and shown Hoytt by the owner won the National in the regular obedience class. Meaning they had to beat a great many more Dobes then if they had been showing in the Top20 - Also Hoytt Dobes have been on the cover of more magazines related to the dog world than any other breeder to date. World Class 100% American breeding and at no time since 1984 will non Hoytt Dobes show up in our pedigrees. Every aspect from style, health and personality is known. Each of the Dobes who enter or will enter our breeding programs since created. Today clients put aside the distances between us as you will note looking at our 2018 & 2019 placements. Go to our Client Gallery you will see that for decades we have maintained unmatched quality and an exceptional following. While there are many great Dobermans in homes throughout the world not whelped by us there are thousands of Dobermans who end up in Rescue because they were found to not fit the owners expectation and of course so many are bred and bought on impulse. But why turn to Hoytt for a Dobe we've created and most times trained - well for those who are Hoytt Dobe owners no question since they have enjoyed an exceptional Dobe already from Hoytt and those folks who literally have dream of bringing into their life a very special Doberman without the hundreds of unknowns that can show up not only in the Dobe but all the breeds today. For the American Line they turn to us if in fact they have heard about Hoytt or took the time to studied our programs. These folks will turn to us as their "Experts in Charge" and give us the honor of creating their wonderful dream called the Doberman - why give up seven to fourteen or more years of your life serving a dog who is most enthusiastic to see you ONLY when it knows it's time to eat. Our office number 10 to 4 during the week is 865-397-9887 but you may only receive a recorded message for we asre a serious working kennek and half the day we are playing with, educationing or just hanging out in the kennel making sure all our Dobes in trainig know they have of dozen humans as family until they leave us - please leave a message and you will be called bcak. Also for established clients remember you also have my private cell. Oh yes and visitors welcome only by appointment. SUCCESS HAS IT'S REWARDS...Please spend time reading through our site for it is singly the most complete reference guide available on the Doberman today with more information on this breed's variables then any publication to date. This web site is also the ultimate "breed picture book". Go to our Owners Picture Gallery with more then 3000 photos most send to us from clients over the years with some taken here at the kennel during a Hoytt Dobes development. This gallery is one sure way to see EXCEPTIONAL QUALITY IS THE RULE HERE NOT THE EXCEPTION. We are extremely proud of our success helped by those who welcomed a Hoytt Dobe and when a question arose that needed an answer, only had to email. text or call and Mr. Hoytt or Carol Stephens the next generation protector of the Hoytt Line will be available. Back to the website in general. As a first timers guide to the Dobe this site goes unmatched and especially helpful to those who prefer to pick their own from a seller, broker or Rescue, even plan to HOME SCHOOL. No matter what decision you make as to where your new Dobe comes from, our site will help in your decision making for you are about to devote 7 to 14 years to a canine. Soon you will be your four legged buddy's care giver, teacher, financial backer and part time doctor. ARE YOU READY? As the only breeder to develop, maintain and profile with extreme preciseness what each youngster placed today will be as the adult we also keep a running history of each new generation literally a complete life history. Thus behind every Hoytt Doberman placed today the knowledge gained over our seventy-five years working with buyers and followed by years of Owner Feedback, guide us when matching a pair today for breeding while creating the next generation match two or more years away from breeding. This added information can best be called a living Pedigree remember an actual pedigree is simply a list of dog names and what titles past generations might or might not have gained. Few if any have created a private line like the HOYTT LINE. Today’s sellers probably have no more actual knowledge of the dogs they offer then those they acquired their dogs from. Here our firsthand knowledge of every dog listed in the family tree for decades along with our Client Profiling points out just how we remain the leader in Dobes for decades. We are after all the only breeder in the world to have developed a Private Line of Dobes - For those who have done their homework and are reaching for the BEST we offer Dobermans that for more than forty years have not come from a mix of the hundreds of Doberman breeders & brokers who simply try to breed their Dobes to other registered Dobes. These sellers and brokers rarely know both parents first hand and less about the second generation and near none know third or more generations behind the dogs they are offering. Information given about background dogs usually came from rumors heard or simply created "facts" the seller knows the buyer wants to hear. A simple check of a sellers knowledge of the dog being sold - just ask for or even buy a three or four generation pedigree from the AKC or the Euro club the dog is registered with and your sellers kennel or bloodline name should be on most if not all dogs named. We actually do not know of a Doberman breeder, broker or seller today who can offer such a refined canine nor have the firsthand knowledge of the dog you are about to welcome into your personal circle. A quote from Winston Churchill gets right to bottom line when it comes to knowledge. "The further back you can look, the further forward you can see"
We look back decades into the past of each Hoytt Doberman when choosing the next generation that give us tomorrows Hoytt Dobermans. Great minds and excellent appearance along with unsurpassed medical programs and the extensive health protocols we follow before placement of each Doberman are unmatched in today’s dog world. Check these key points of interest. 1...The only American blood line in Dobermans with no import influences after early the 1970's - Our Line of Dobes began seven decades ago with 100% German breeding like everyone in the early history of the breed because even America had to wait until 1908 before the first Doberman Pinscher joined the ranks of an AKC registered breed. 2...Decades since finds the international evolution of the Doberman so diluted that literally all but the Hoytt Dobermans today are IMPORTS or from IMPORT LINES many from countries we would think twice about visiting. 3...The Hoytt Dobermans are the worlds most protected pure Blood Line - House of Hoytt is the longest/oldest and most successful continually operating Doberman kennel in breed history. 4...We are the breeders of the youngest winning Dobes in American Kennel Club (AKC) sanctioned obedience trials for at least three decades. 5...For working dogs the performance ring is the ultimate test of temperament and intelligence graded by American Kennel Club judges - not someone employed by the seller. .In effect The obedience ring is the test track of the mind. With the Hoytt Dobermans greatness in all the right areas our success attracts those who in their own right are also achievers and know what it took. Once you study our pre-placement programs from medical services to education you will better understand what we are about. Note we have not updated this area of presentation since we redesigned this web site in 20 web site. Our way of showing we are as good today as we were with the years of Hoytt Dobe placements we present under Owners Picture Gallery.